Netflix has finally announced when the new season of Orange Is The New Black will be available to stream. Unfortunately, fans of the hit comedy-drama series will have to wait a month longer than normal, however, as season six will be moving away from its usual June release. In a brand new teaser clip, it has been confirmed the show will instead make its return on July 27, 2018. The teaser also shows an eerie and destroyed Litchfield cafeteria, in which a prison bus can be seen driving off through a broken window. A voiceover then states: “This is a whole new world”. Orange Is The New Black season 6 lands on Netflix on July 27. The day we have all been waiting for finally arrives tomorrow, as the fifth season of Orange is the New Black is released onto Netflix. After months of waiting in agony, OITNB season five will be available to view from Friday, June 9 on the popular streaming service. Last year’s season finale left us on quite the cliffhanger and viewers have been itching to find out the fate of the Litchfield inmates ever since. 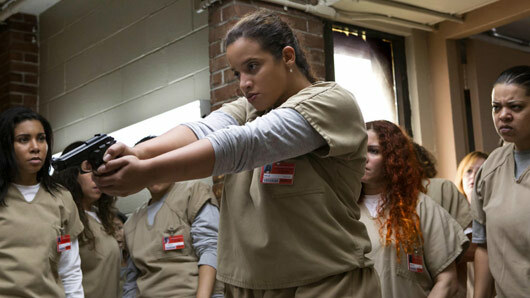 After they rose up to take revenge over the covered-up manslaughter of Poussey, the inmates took over the prison in the last scene, with Taystee leading a charge of attack and Daya pointing a gun at Thomas Humphrey’s head. This season will answer the question everyone is asking: Will Daya pull the trigger? In an interview with The Hollywood Reporter, Dascha Polanko (Daya) suggested her character could very well be capable of shooting Humphrey. She said: “I think Daya’s definitely experiencing some postpartum depression. We will have to wait until tomorrow to find out how this rebellion ends, but Taystee actress Danielle Brooks was able to give fans a small teaser about the upcoming season. Orange is the New Black season five lands on Netflix tomorrow (Friday, June 9). For the first time ever, viewers can watch Orange Is The New Black on television as Sony Channel premieres the show tonight at 9pm. For those of you who do not have access to a Netflix account, you can now rejoice! You no longer need a subscription to the streaming service to watch the multi-award winning comedy series Orange Is The New Black. The widely-loved show will now be airing every Wednesday at 9pm on Sony Channel, as of tonight (April 19). 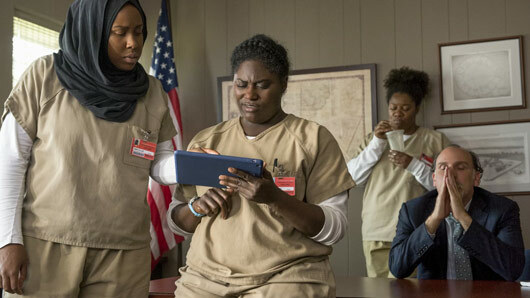 Sony Channel is available on Sky channel 157, Virgin Media channel 193 and TalkTalk channel 331 and will broadcast OITNB from the very beginning of season one. 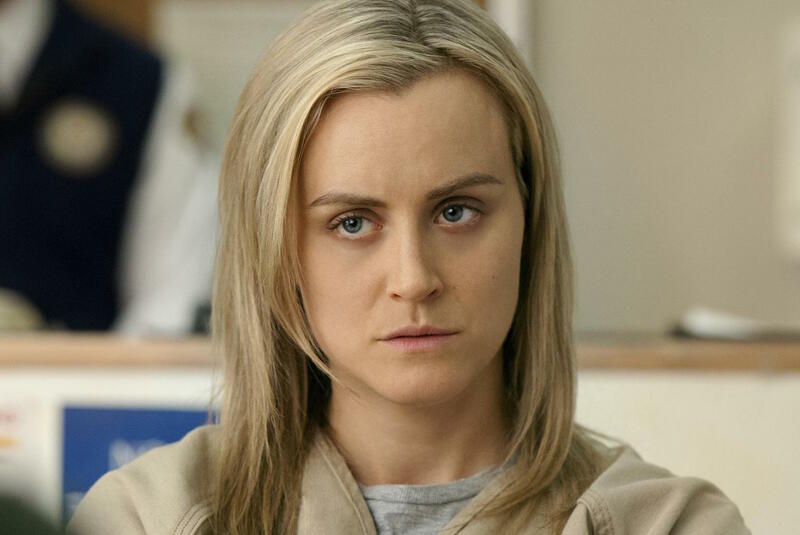 In tonight’s episode, we see the straight-cut, middle-class Piper Chapman enter into Litchfield woman’s prison for the first time, and let’s just say she doesn’t receive the warmest welcome from her fellow inmates. As each episode focuses in on a different character’s backstory, the show takes on a number of difficult subjects including gender, sexuality, race and the criminal justice system in a way that manages to be thought-provoking, hilariously funny and heart-warming all at once. Sony Pictures Television’s executive VP, Kate Marsh said: “We recognize the demand for premium content that appeals to a broad audience, which is exactly what Orange Is the New Black offers. Make sure to tune in this evening to get yourself up to date before the new season lands on Netflix in June! Orange Is The New Black premieres on television tonight (Wednesday, April 19) on Sony Channel at 9pm. 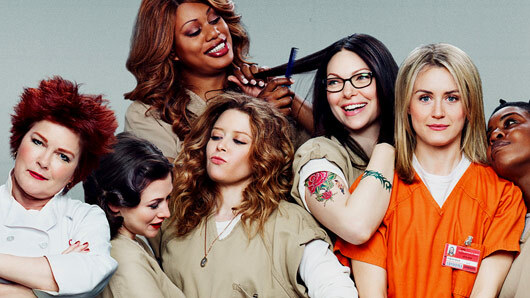 The ladies of Litchfield Penitentiary have returned to Netflix for fourth season from today. However, if you’re still at work or unable to find a spare moment this weekend for a satisfactory binge-watch, whet your appetites with what the critics are saying. 1. It’s a marked improvement from season three. 2. In fact, some would argue season four is the best one yet. 3. It’s as dark and relevant as it has ever been. 4. There are mixed opinions on the new characters – some proclaim them just as lovable and complex as the rest, while others are unimpressed. 5. Of course, there wasn’t unanimous applause. Orange Is the New Black season four is available now on Netflix. 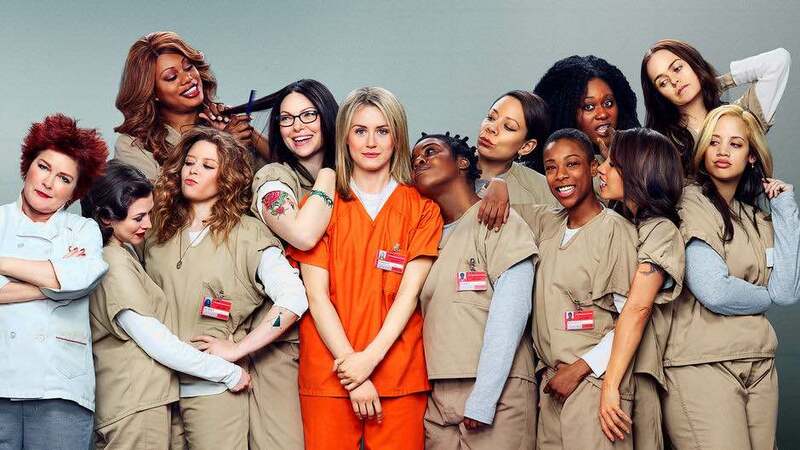 COMPETITION: Win Orange Is the New Black season 3 on DVD! The ladies of Litchfield Penitentiary are back for a new season of the critically acclaimed Orange Is the New Black, which is released on DVD from Monday, May 16. 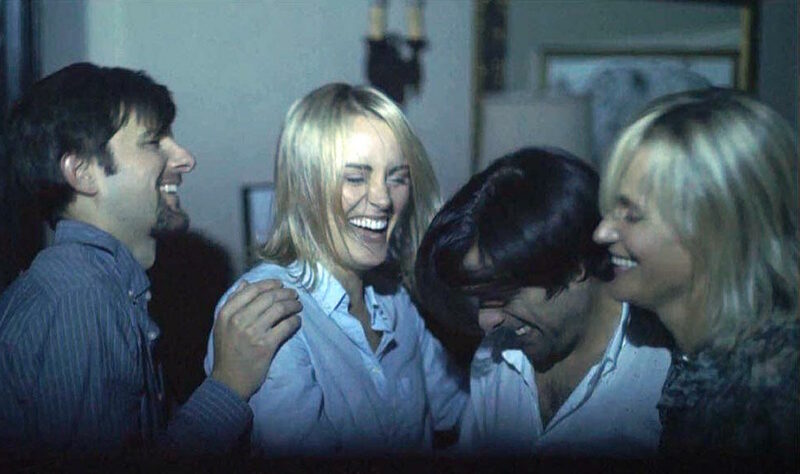 The award-winning series is based on the real life experiences of money laundering convict Piper Kerman at a low-security women’s prison in Connecticut. It’s been praised for being honest, funny and a breath of fresh air, while also sensitively portraying the struggles of being a woman and humanising its characters – women at an all-female prison. In the show’s third season, Caputo’s new – softer – regime is in place, which causes mixed feelings amongst the prisoners and staff at Litchfield. There’s a mother’s day fair, a bed bug infestation, and plenty more still to go wrong. *To celebrate the release of Orange is the New Black season three on DVD on May 16, we’re offering TVGuide.co.uk users the chance to win one of three 4-disc DVD boxsets (RRP £34.99). This competition is now closed. The winner will be selected at random from all entries. Please see full Terms and Conditions here. 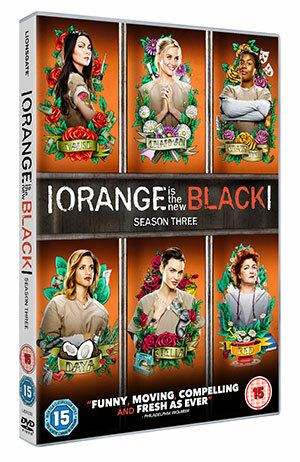 Season three of Orange is the New Black is out on DVD/Blu-ray from May 16 and is available to preorder now. The trailer for season three of Orange is the New Black is finally here! The trailer indicates no sign that the craziness we’ve become accustomed to will take a back seat this season. It’s filled to the brim with Piper and the rest of the ladies from Litchfield Penitentiary back to their usual tricks. We also catch a glimpse of both new and returning guards and in-mates, including Laura Prepon’s Alex. Yes, we’re as curious as you are about why she’s crying! Season three of the hit Netflix Original will be available to stream from June 12.